Observers can learn the likely locations of salient distractors in visual search, reducing their potential to capture attention (Ferrante et al., 2018; Sauter et al., 2018a; Wang & Theeuwes, 2018a). While there is agreement that this involves positional suppression of the likely distractor location(s), it is contentious at which stage of search guidance the suppression operates: the supra-dimensional priority map or feature-contrast signals within the distractor dimension. On the latter account, advocated by Sauter et al., target processing should be unaffected by distractor suppression when the target is defined in a different (non-suppressed) dimension to the target. At odds with this, Wang and Theeuwes found strong suppression not only of the (color) distractor, but also of the (shape) target when it appeared at the likely distractor location. Adopting their paradigm, the present study ruled out that increased cross-trial inhibition of the single frequent (frequently inhibited) as compared to any of the rare (rarely inhibited) distractor locations is responsible for this target-location effect. 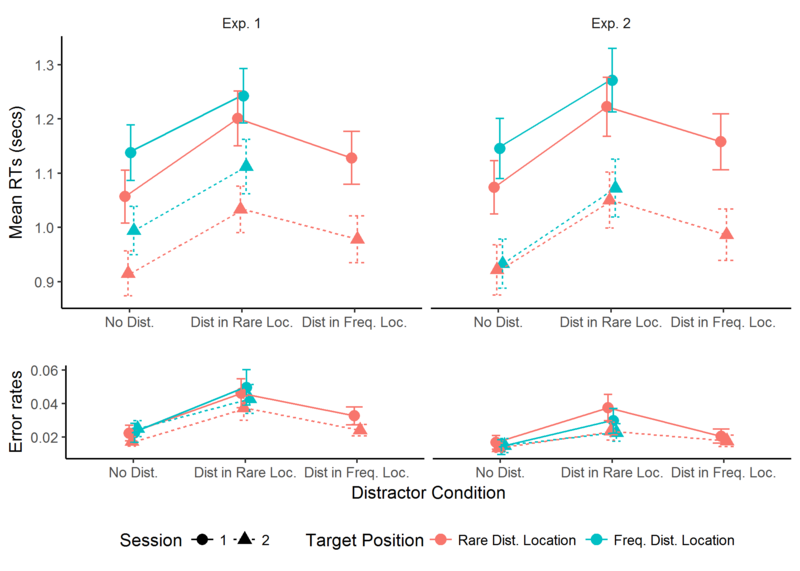 However, a reduced likelihood of the target appearing at the frequent vs. a rare distractor location contributes to this effect: removing this negative bias abolished the cost to target processing with increasing practice, indicative of a transition from priority-map- to dimension-based – and thus a flexible locus of – distractor suppression.